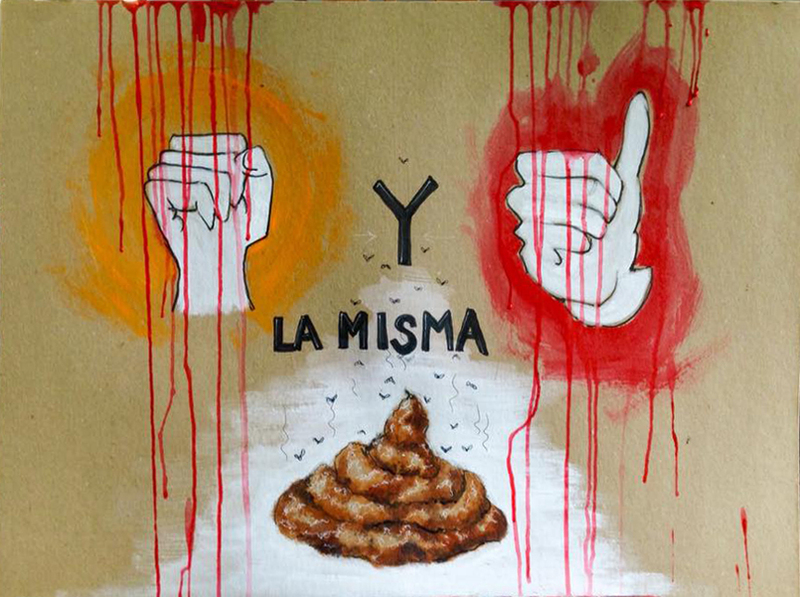 A Hand-Painted Sign seen at the August 28, 2015 protest march in Antigua, Guatemala indicating a content-heavy view of the similarities between political parties, in re: corruption, in Guatemala. In the afternoon of September 1, 2015 the Guatemalan Congress voted (132 to 0, with 25 abstentions) to remove executive immunity from President Otto Pérez Molina. Late on September 2, Thelma Aldana, the Guatemalan Attorney General, issued an arrest warrant on charges of illicit association, fraud and receiving bribe money for Pérez Molina, and as this story goes to press at 1:35 AM on September 3, it is being reported that the President has resigned his office. One can now easily imagine the old general stirring in his chambers — mistrustful, agitated, and fearful of capture, likely wondering how everything had gone so terribly wrong so very quickly. Only a year before he was at the top of the world. He was the unquestioned, if somewhat stymied, authority in the nation. He had secured himself and his family tremendous wealth and planted the seeds of political dynasty. He had successfully slipped away, through guile, good fortune and possibly even a touch of actual innocence, from accusations of his personal involvement in genocide and crimes against humanity during the Guatemalan civil conflict in the 1980s, allegations of having participated in the disappearance of the popular leftist leader Efraín Bámaca Velásquez in 1992 and the murder of Roman Catholic Bishop Juan José Gerardi in the 1998. Last year, President Pérez Molina only needed to survive one more trip around the sun and he could retire a free and wealthy man with many political connections still firmly in place. That, it appears, was not to be. Much as comes to pass for the Simon Bolívar character in Gabriel García Márquez’ historical novel, The General in His Labyrinth, President Pérez Molina’s life began to unravel at the end, setting him wandering through the maze of his own memory searching for an escape, and all of it began by pulling on a single thread. Or, to be a bit more creative with translations, una linea. A few days before the Congressional vote, on August 28, eighty-thousand people crowded into the Plaza de la Constitución in Guatemala City to protest not just the corruption that has grown in the many shadows of the Pérez Molina administration, but throughout the political and business culture of the nation. There is a recognition among a growing plurality, possibly a majority, of the citizenry that their country has fallen into a relentless cycle of corruption, graft and ineptitude. Theoretically in a democracy the rulers change but the basic concepts of human dignity, freedom of expression, freedom of opportunity, the sanctity of the franchise and protection of the most vulnerable remain. In Guatemala, however, it has come to pass that what remains election after election is a persistent foundation of impunity for the elite and the blind robbery of the public to benefit the most powerful members of society — and the people are, at long last, standing up and demanding change. The August 28 demonstration was the culmination of several days of anti-Pérez events across the country, sparked by the airing of a recording in which the President’s voice is clearly identifiable during the first stages of the trial against former Vice President Roxana Baldetti, who resigned in May of this year and was arrested on August 21 for her involvement in a network of corruption commonly referred to as La Linea, or the Line. The scandal broke earlier this year when the International Commission against Impunity in Guatemala (CICIG, in its Spanish acronym) revealed the existence of an embezzlement network in the nation’s customs authority run by Baldetti’s personal secretary, Juan Carlos Monzón Rojas. CICIG, a United Nations body granted power to root out corruption in Guatemala found that government officials were colluding with major figures in business to defraud the treasury of customs duties to the tune of at least several million dollars per year. Through a series of wiretaps, connections were found first to Baldetti and then to Pérez Molina. In a nutshell, the scheme worked as a double-blind with a few well-placed go-betweens running the information, paperwork and cash between businessmen and government officials in SAT, the Guatemalan tax and customs service. SAT officials let it be known to select individuals — those in La Linea — that customs duties on imports could be lowered by sixty percent if the businessmen were willing to play ball. The breakout of those numbers was forty percent of the expected revenues going to the national treasury, while thirty percent stayed in the pockets of the importers and thirty percent in payment went directly to the SAT members of the La Linea scam. They then kicked a percentage of their take up the chain, allegedly all the way to the Vice President’s office, and quite possibly to the President’s office, as well. This form of wealth expropriation is old hat in Guatemala. Similar graft schemes through the customs branch of SAT have existed for decades. The excellent (and often hilarious) journalists at Plaza Publica, Bill Barreto and Oswaldo J. Hernández, recently reported that one mid-level operative of La Linea, who was also a mid-level operative of the Moreno Network of SAT corruption in the 1990s was recorded by CICIG boasting “I have 18 years of experience in the business!” The business, sadly for him and for the citizenry, was patently illegal. A centrally important graduate of La Promoción 73, is, of course, President Otto Pérez Molina. Who says there is no honor among thieves? What Amador means by the “parallel powers” is crucial to understand. For a very long time in Guatemala the government has been as much a theatrical production as an author, enforcer and interpreter of law. There is crossover between the on-stage talent and company management, of course, but the real authority in the country has long been held by those behind the scrim. They are the ones who have operated for decades with impunity. Criminal investigations into their activities have been stopped cold by threats to judges inclined to find against them, journalists who dare to report their dealings or witnesses to their illegal activities — and the courts have long been the last line of defense. Before reaching that desperate limit, legislators are strongly advised (and well-compensated) for drafting lenient code and prosecutors are likewise incentivized away from pursuing threatening cases. All of that has been standard operating procedure in Guatemala for a very long time. Maybe the real question that Pérez Molina might ponder as he wanders through his labyrinth is why the nation finally decided, ¡Basta ya! To understand that, first one must consider the impact CICIG has had on the Guatemalan state. Established in 2006, during the presidency of Óscar Berger, CICIG came into being through an agreement with the United Nations to investigate a number of sensitive legal cases that were being thwarted by the parallel powers within the nation. CICIG’s mission is to support the Public Prosecutor’s office and the National Civilian Police (the PNC in their Spanish acronym) so that they might one day take on the lead role in confronting organized-crime networks running throughout the society and government. Originally, CICIG’s mandate for operation was set to expire in 2009, but was extended until 2011. Then, in early 2012, freshly elected President Pérez Molina promised to continue their charter until the end of his term. He may now regret that decision. Over the years CICIG has proven a remarkable success. A short list of their accomplishments includes the arrest of Byron Lima Oliva, the convicted murderer of Bishop Juan Gerardi, on charges of running a massive bribery ring while supposedly in prison for the original crime. Lima, with strong familial ties to the parallel powers, was arrested while traveling outside the prison with his entourage in vehicles owned by the Patriotic Party, the political party of Pérez Molina, during the latter’s 2011 election campaign. Through this arrest, it came to light that Byron Lima had long traveled freely in and out of prison, despite his supposed incarceration. CICIG also pursued charges against former president Alfonso Portillo for corruption. He was acquitted in Guatemala despite significant evidence against him, but later faced charges of money laundering, fraud and embezzlement in the United States. He pled guilty to the charges, and despite a potential twenty-year sentence, he spent little over one year in prison and then returned to Guatemala in early 2015. Perhaps most significant, and controversial, was CICIG’s involvement in the prosecution and conviction of former Guatemalan dictator Efraín Ríos Montt on charges of genocide. Ríos Montt was sentenced to 80 years in prison, but his conviction was overturned the following day by a friendly court. La Cuadra covered that case as it transpired. One other case that La Cuadra readers may remember is the pursuit on charges of extra-judicial murder of one Erwin Sperisen, the former chief of the National Civilian Police (PNC). Sperisen gambled against the assistance of the parallel structures in his homeland and fled to Europe where he is currently serving life in prison in Switzerland for executing an inmate during a raid of El Pavón prison. Bad bet, that. The successes of CICIG have, undisputedly, emboldened the people of Guatemala to believe that change is possible in their nation. Earlier generations of Guatemalans have known — how could they not? — that their opaque, barely functioning, historically unjust government was rife with murder, extortion, pay-to-play schemes, embezzlement and mind-bending cover-ups over cover-ups over cover-ups. To challenge those systems was, however, life-threatening. Now, despite widespread doubt, CICIG has proved, beyond doubt, that deep-seeded corruption can be pulled out, prosecuted and punished in the name of the people. That is a dangerous thing to those who rely on secrecy, threats and violence to maintain their advantages behind the scenes, as the members of La Linea are now finding out. The second factor that has driven the people to act is the sheer callousness of those who are causing harm to the nation. This is not a nation of innocents. Most Guatemalans understand zero-tolerance of corruption is a fool’s dream. Yet, there is also the understanding that there are limits and that those limits have been shattered by the current residents of the parallel power structures today, most notably in Caso IGSS, the IGSS case. The Instituto Guatemalteco de Seguridad Social is the Guatemalan Social Security Agency. Its annual budget is close to two billion dollars and it generally has about five billion dollars under management. Its mission is to provide healthcare and social services to all Guatemalans, particularly those with no means to provide for themselves through a private network. To say the least, this is a ripe and low-hanging fruit to those whose motivations are impure. Over time the organization has been plagued by nepotism, influence peddling, no-bid contracts, graft and the occasional public embarrassment of receiving money to build housing for the elderly and then just never bothering to even break ground. The contract was pulled from PISA on May 15, 2015, citing deficiencies in the patient-education plan. The people of Guatemala, however, seem to have reached a point of educational saturation with rampant corruption in their government and the coarse, scornful treatment that the citizenry receives when the elite remain forever distanced from justice. So they march while their President faces imminent arrest. From here the path is unclear, upon that the Dictator in His Labyrinth and the People in Their Streets might agree. Adding to the lack of clarity is the fact that the next round of Presidential elections is scheduled for this weekend, and Guatemala may well see the election of a new leader who, if the signs that seem so very obvious are being properly read, is the very manifestation of corruption and political debasement. It is also worth remembering that CICIG’s lease-on-life in Guatemala ends either when a new president is sworn in next January or when Otto Pérez is arrested, impeached and removed from office. That will be a matter for the courts. Watching how they come to their conclusion will be indicative of the way the winds are blowing, to say the least. What is very clear, however, is that the citizens of Guatemala will not be satisfied returning to their fitful, frustrated sleep after awakening to the power of unified action. It is also very clear that the next President of Guatemala may have little tolerance for their protests and a great dissatisfaction, after waiting patiently for his turn in power, that the riches of corruption have been snatched from his grasp. Take a deep breath, readers. There’s a new beast entering the maze, even as the old one is being shown, ignominiously, the exit. Things are about to go from unpredictable to flat-out weird.